Established during the year 2009 amongst anticipations galore, Manchester InternationaI School has ever since never halted in its painstakingly inclusive vision to create, nurture and flourish a compassionate community, which thrives with inquisitive learners. MIS does not represent barely an aspiring art of a contemporary engineer but takes pride in remaining a temple of knowledge. The quintessential feature of the school remains in upholding unrelenting interpersonal relations amongst the entire students and staff, which had led to substantial success over the years. The enthralling edifice of the buildings is in adherence to and in fond memory of the revered Renaissance Art & Architecture, complemented by lavishing landscape. 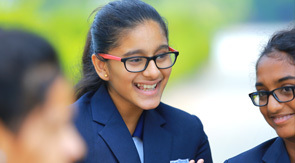 One among many of the distinct features of the school lies in its amply enormous state-of-the-art classrooms and upholding the sovereignty and integrity of the National and International curricula (- CBSE, IGCSE, AS & A Levels, IB PYP & DP ), focussed to implement holistic or wholesome education to its aspiring students. "I can say with certainty that this is hands down the best welcome and experience we have ever had with a school, Thank you for the hospitality team Manchester. Definitely this quality will give you the place of top 10 international school in India."